Eggs are all-natural and provide one of the highest quality proteins of any food available. Don’t let misinformation prevent you and your clients from making better food choices when it comes to embracing a nutritious diet. Click Get Content to download the facts around six commonly believed egg myths! Myth: The cholesterol in eggs contributes to heart disease. The Facts: More than 40 years of research have demonstrated that healthy adults can enjoy eggs without significantly impacting their risk of heart disease. In fact, the recent report issued from the 2015 Dietary Guidelines Advisory Committee makes no specific cholesterol recommendation, in contrast to earlier guidance, and states that cholesterol is not a nutrient of concern for overconsumption. Myth: Specialty eggs (cage-free, free-range, organic, etc.) are more nutritious than white “conventional” eggs. The Facts: Egg farmers offer consumers a choice when it comes to their eggs, which is why so many types of eggs can be found at your local grocery store. However, it is important to note that there is little to no nutritional difference between different types of eggs. The Facts: No hormones are ever given to egg laying hens. All eggs produced in the U.S. are all-natural and do not contain added hormones. Myth: All of the high-quality protein in eggs is found in the egg whites. The Facts: While egg whites contain some of the eggs’ high-quality protein, egg yolks still contain 42 percent (nearly half) of the high-quality protein in eggs. Don’t throw that yolk! The Facts: According to the USDA, eggs in their shells are not a genetically modified food. Scientific research also has confirmed that none of the genetically engineered materials that may appear in some hen feed are passed into the egg. Myth: The bacon trend is over. The Facts: Bacon still sizzles, especially if it’s Kevin Bacon. For extra laughs or a break in your day, check out our Web Film featuring the most famous Bacon of all. After all, nobody knows eggs better than Bacon. 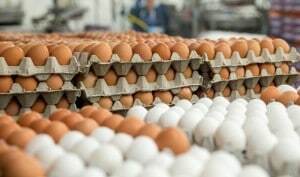 The egg case can be a confusing place, which is why the American Egg Board has created a useful fact sheet for you and your clients that address common egg types, defines frequently used seals and terms on egg cartons, and explains egg freshness. A printable version is also available to download here. Making a dozen hard-boiled eggs on Sunday ensures you have a nutritious, grab-and-go snack whenever you need it. 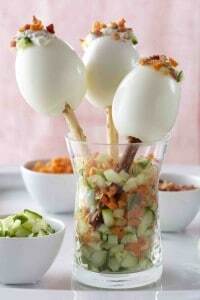 Try out these ideas to keep your hard-boiled egg snacks fresh and fun all week long. Go fancy with your salt and pepper. Try truffle salt or spicy chipotle salt for a little heat. Season hard-boiled eggs with salt-free lemon and pepper seasoning mix or low-salt herb mix. Make it spicy with a dab of Sriracha. 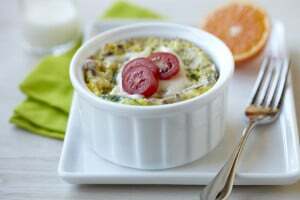 Dip your eggs in honey mustard or ranch dressing and add chopped veggies to top it off. 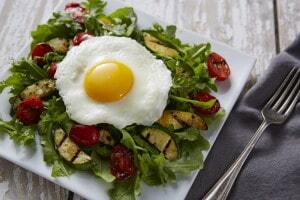 Top your lunch salad with hard-boiled eggs. Add it to a bento box filled with hummus, olives and vegetables for a delicious afternoon snack. Egg yolk is among the few commonly consumed foods containing the carotenoid lutein and its stereoisomer zeaxanthin. Spinach and other dark leafy greens may have a higher content per serving, but lutein/zeaxanthin is absorbed and utilized better from egg yolk [Chung, 2004]. Researchers at Purdue are studying the benefits of co-consuming foods within the same meal. In a recent publication, co-consuming eggs with a raw mixed-vegetable salad resulted in enhanced absorption of carotenoids versus consuming the salad alone. Findings are reported in the American Journal of Clinical Nutrition. Rebecca Scritchfield, MA, RDN, ACSM HFS recently wrote a comprehensive blog post breaking down the three plant-based, healthy eating patterns recommended by the 2015 Dietary Guideline Advisory Committee. Such diets have been shown to reduce the risk of major chronic health conditions we face as a nation. A Plant-Based Diet Doesn’t Mean Just Plants: At each meal, pairing plants with 20-30 grams of high-quality protein like eggs, fish, chicken, lean meat, and low-fat dairy can help support healthy muscles and strong bones and keep you feeling satisfied. Long Live the Mediterranean Way: This stands as one of the world’s healthiest and tastiest ways of lifestyles. So what is it about this lifestyle that is so protective? Lots of physical activity for one, but also this style of eating thrives on an abundance of fruits and veggies, olive oil, more fish, less red meat and processed foods, and they enjoy their wine in moderation. The Pattern on Your Plate: Composing a healthy meal means getting the right balance of proteins, carbohydrates and fats. When planning out your Balanced Plate fill your plate at each meal with one-half fruits and vegetables, one-quarter protein and one-quarter grains or starches. But don’t forget the fat. Studies now show enhanced absorption of nutrients in veggies when consumed with a source of fat, such as eggs or olive oil. The incredible egg is a staple when it comes to holiday baking. Have fun in the kitchen while making life a little easier with these helpful egg hacks. USE ROOM TEMPERATURE EGGS. Be sure to let the eggs for your recipe sit at room temperature for 20 to 30 minutes before starting so they are ready for mixing. 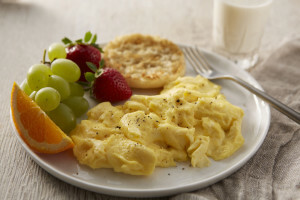 Cold eggs added to some recipes can harden the fat and cause the batter to curdle. ADD EGGS ONE AT A TIME. After creaming butter and sugar, eggs should be added one at a time. Thoroughly beating before the next egg is added, this helps the mixture retain more trapped air bubbles that contribute to leavening. SEPARATE COLD EGGS, WHIP ROOM TEMPERATURE EGGS. Eggs are easiest to separate when cold, but whites reach their fullest volume when whipped at room temperature. Room temperature egg whites absorb more air than cold ones. MIX YOUR MERINGUE. Sugar serves to increase the stability of the foam. It must be added slowly so it doesn’t decrease the volume. 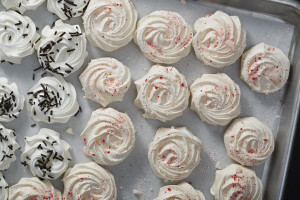 When beating your meringue, it is important to check to make sure your sugar has dissolved into the egg whites. To test, rub a bit of meringue between thumb and forefinger. If sugar is dissolved, it will feel completely smooth and if it feels grainy or sandy, continue beating. MAINTAIN THE FLUFF. Did your perfect meringue lose its fluff? The air beaten into egg whites can be lost quite easily. A small amount of an acidic ingredient, such as cream of tartar, lemon juice or vinegar, acts as a stabilizer and will help keep your fluff intact. Remember to spread the meringue over the filling when it is hot – this prevents weeping and keeps the two layers from sliding apart. Be sure to anchor the meringue to the crust all around the edge of the pie to prevent the meringue from pulling away from the edge during baking. DIVIDE THE COOKIE DOUGH. When rolling and cutting cookies, work with half of the cookie dough at a time. Keep the other half refrigerated. It is easier to roll out and too much handling can make the cookie dough warm. Chill cookie cut outs before baking to keep their shape. WASH & SHINE. Lightly beaten eggs, whether whole, separated, plain or combined with water or milk, can be used as an "egg wash.” Brush the egg mixture on the surface of breads, pastries, cookies, pretzels or biscuits to help them attain a beautiful shine when baked. STORE COOKIES FOR OPTIMAL FRESHNESS. Don't combine different kinds of cookies in one container because the chewier cookies make the crispier ones soggy. 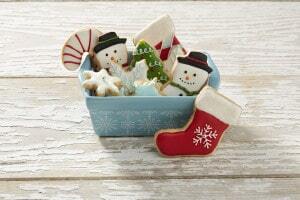 Baked cookies and bars can be frozen up to 3 months. Most cookies and bars freeze well and can be made ahead, delicate cookies or cookies that are dipped in chocolate are better made last. Cookie dough can be stored in the refrigerator up to 4 days or frozen up to 2 months. For holiday recipes, baking hacks and more, visit IncredibleEgg.org and Incredible Eggs on Facebook, Twitter, Instagram and Pinterest. Egg Nutrition Center (ENC) administers an annual research grant program with over $2 million funded by America’s egg farmers. ENC works with top researchers from top universities in a credible and transparent manner. The control of both study design and the research itself remain with the scientific investigators, not with ENC. Written agreements specify that the investigative team has the freedom and obligation to attempt to publish findings, regardless of the outcome. ENC-funded studies have been published in some of the top nutrition journals. Some of the latest research includes new findings in cardiovascular disease, satiety, and nutrients for a healthy pregnancy.